The second day of main draw action at the Miami Open had a tantalising schedule. I’m rather shocked I was able to watch all the matches that I wanted to before sleeeep. 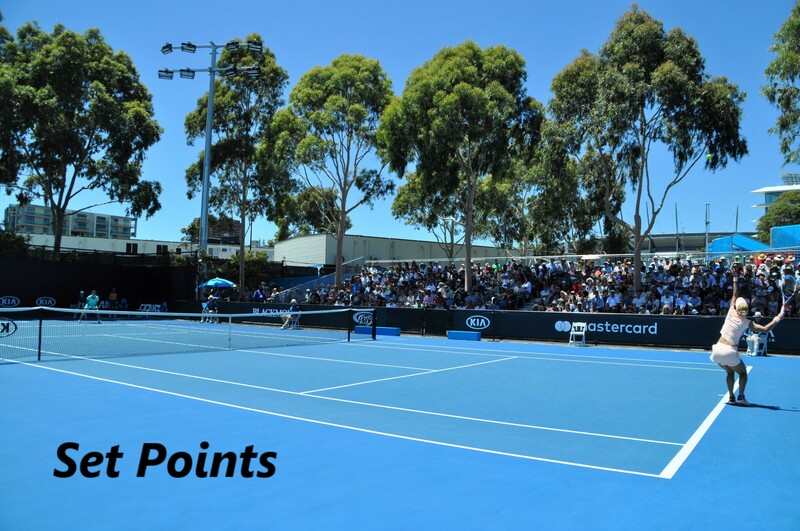 This post recaps first round day action with wins for Naomi Osaka, Victoria Azarenka, Ekaterina Makarova to name a few. Read on for eight stories from Wednesday in Miami. Ekaterina Makarova reached the second round of the Miami Open with a 6-2 2-6 6-4 win over Timea Bacsinszky. It was another improvement from Bacsinszky who is seeking her first singles win since Wimbledon after six months on the sideline due to a serious hand injury. Compared to her performance in Indian Wells, Bacsinszky served much stronger, was more stable on the forehand side and competed deep into a third set against a quality player. Makarova, went AWOL for a time in the third set with an avalanche of errors through overforcing. She played a fantastic point to break Bacsinszky’s serve at 4-4 and generally settled down to win the last three games of the match. Makarova faced a break point serving for the match. Bacsinszky hit the return wide. I’m encouraged by Timea’s improvement match-by-match and she just needs matches! Keep going, Timea 🤗. Makarova advances to an intriguing second round match against Karolina Pliskova. The Russian player hasn’t dropped a set against Pliskova in three previous encounters. Definitely an upset alert as Pliskova has not been that convincing in 2018. Side note – it seems Makarova is back with Evgenia Manyukova as her coach who she ranted at during a changeover in the third set! A festival of funkiness – Niculescu vs. Poots! Forget S.Williams vs, Osaka, the match of the day was obviously Monica Niculescu against Yulia Putintseva 😂. These two are so much fun to watch on the tour so I had to tune in! Niculescu prevailed in straight sets, 6-2 6-4. She barely got a handshake from Putintseva at the end. Niculescu was bamboozling Putintseva for a set and half. Putintseva managed to narrow the scoreline as she began charging the net (with mixed success) and Niculescu started to make some errors. There were some fab rallies! Ultimately Putintseva lacked patience and ran out of ideas against a mostly solid and effective, Niculescu. Putintseva gave the umpire, Kader Nouni, a piece of her mind at the end of the match. Of course the most anticipated match of the day was fourth up on Stadium court between Naomi Osaka and Serena Williams. Osaka continued where she left off from in the desert with a superb 6-3 6-2 victory over Serena Williams. Williams faded in the second set but all the credit to Osaka. The Japanese player was brilliant, peaking towards the end of the first set with some fabulous tennis. I was impressed how Osaka was able to settle in completely different conditions to Indian Wells and against a player she had admitted that she idolises. I enjoyed Naomi’s words in her post-match interview. She’ll aim to keep her run going against the number four seed, Elina Svitolina on Friday. What a brutal draw. Victoria Azarenka played a great match to beat CiCi Bellis, 6-3 6-0 in just 66 minutes. This was vintage Vika who barely put a foot wrong in the second set. Azarenka backed up her first serve so well, returned deep and consistently, and built points brilliantly with many forays into the net. Bellis showed a few flashes of quality, mostly from the forehand side. These were never sustained and she was very vulnerable on serve, particularly behind the second set which Azarenka took apart with authority. Wonderful to see Vika in this form who plays Madison Keys in the second round 🍿🍿🍿. It was nice to see Bethanie Mattek-Sands back on a tennis court. Her doubles comeback has been delayed as Lucie has been ill, yet she played her first singles match against Alizé Cornet and gave it plenty of welly. Cornet eventually prevailed, 6-2 7-5. There was a nice moment between the pair at the net. It's a straight sets win for @alizecornet! Take a bow, Chad. This is an amazing shot 👏👏👏. Go follow Chad on Twitter for more great updates from Miami. I’m gutted that Amanda Anisimova was forced to withdraw from Miami after a nasty fall in the first round. Garbiñe Muguruza advances to the third round. March 21, 2018 in Miami, Set Points, WTA. Collins(R#83) def Begu(R#37) 6-1,6-1. Collins has moved up from R# 160 on Jan1 to R# 83 today. Her good showing in IW is continuing in Miami. Begu(R# 37) looked like she was having a very off day, as she couldn’t find the court. Bellis with her very slight frame will continue to have difficulty with the big hitters. I’m still very surprised at what great shape Azarenka is in, after her very long layoff. She is in better condition than before her pregnancy. Great win for Collins and CoCo next, winnable i’d say. I thought there would be a big drop off in play from Osaka after winning IW, but I saw nothing. I’m picking Osaka to win the whole kit-and-kaboodle. I had both Osaka and Azarenka coming through. Osaka said it herself after IW, that she didn’t play aggressively against Kasatkina, so I knew she had something left in the tank. Serena is getting warmer with each play but Osaka is downright oven fresh hot. I see the winner likely coming from the top half. Not fully set on Osaka yet. I want to see her play a hot counter puncher with variety. I hope Svitolina is able to do that or a fruit ninja like Niculescu. Her post match presser was quite telling. She actually wanted Serena to acknowledge her performance and at times of indecision, she asked herself what will Serena Williams do even though that was the very person she was playing. Some say Kastakina lives and breaths ‘Nadal’, Osaka basically wants to step into Serena’s shoes and be that player. Fruit ninja haha! Osaka-Svitolina should be fun. Yes I thought the change in conditions and playing her idol would be challenging for Osaka but she played a brilliant match. So consistent, big serves when she needed it. Saw a picture of Konjuh on WTA Twitter with her whole left arm in a wrap. Apparently this is her 3rd surgery on her elbow, and she is only 20 y/o. Hopefully the 3rd time is the charm. Yup saw this morning, that’s rough for Ana. Osaka was so impressive against Serena, playing her idol and backing up the biggest title of her career. Serena didn’t play a bad match, although she’ll be unhappy with her first serve percentage and unforced errors. Naomi did well to get a few big serves back early on with an awful lot of depth, which clearly affected Serena mentally later in the match. And Serena struggled with Osaka’s serve at times, which was regularly hitting speeds of over 115mph. I hope Svitolina is feeling up for the challenge because the young (American sounding) Japanese player is just red hot right now! I was surprised how well Osaka played, even after IW. Osaka-Svitolina should be fun. I do think Svitolina will be able to put more pressure on Osaka’s serve than Serena was able to. If she can keep her own service games strong then I think Elina will win. Ive taken Osaka or kerber to win the whole tournament. Go OSAKA! !